e price of freedom might be paid in souls. LotFP: Weird Fantasy Role-Playing presents a sinister and horrific twist on traditional fantasy gaming. Simple enough for a beginner yet meaty enough for the veteran, this game will make all your worst nightmares come true. 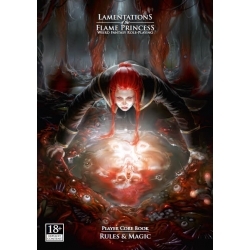 This book is a revision of the Rules & Magic book originally found in the LotFP: Weird Fantasy Role-Playing boxed set. It contains all the rules needed to play the game. This is the first book of a two book set. The Referee Core Book: Procedures and Inspirations contains information and guidance about constructing and running campaigns and adventures.